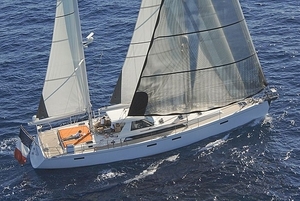 ... noticeable about the Saffier Se 26 ft open day sailor is the possibility to equipe the yacht with either a tiller or a helm. The cockpit is very spacious and a lot of attention has been paid to ergonomics. A center cockpit sailboat is a vessel whose cockpit is situated near midships rather than the more traditional stern location. This configuration is typically used for blue-water sailboats since it significantly enhances crew safety. Generally, the stern of such vessels has a cabin, lazarette or access to steering gear instead of the usual cockpit. As with other sailboats, these craft can be built of polyester or epoxy laminates, sandwich material, aluminum, steel or wood. Crew size and intended use will determine the number of cabins, from two to four, or more. A split rig can reduce physical effort during maneuvers. Examples include a ketch, with main and mizzen sails, or a schooner, with main and foresail. Standard equipment varies with manufacturer.